I’m undecided as to whether or not it’s a tragedy that the Gala Bingo Hall on Portland Road is soon to be torn down. It is in an awful state, though, as the restoration of Embassy Court has shown, it could be put right. But what could it be used for? Anything but more flats! Portland Road was originally called Clarendon Villas and was specifically part of Aldrington, not Hove. In 1885, there were only several buildings along its length and in 1887 the eastern end was named Bertram Road. Aldrington and Hove amalgamated in 1892 and in 1896 the entire road was renamed Portland Road, after the Duke of Portland. There were fields, brickfields and market gardens in between the various properties but by 1900, the gaps had been filled with new buildings. 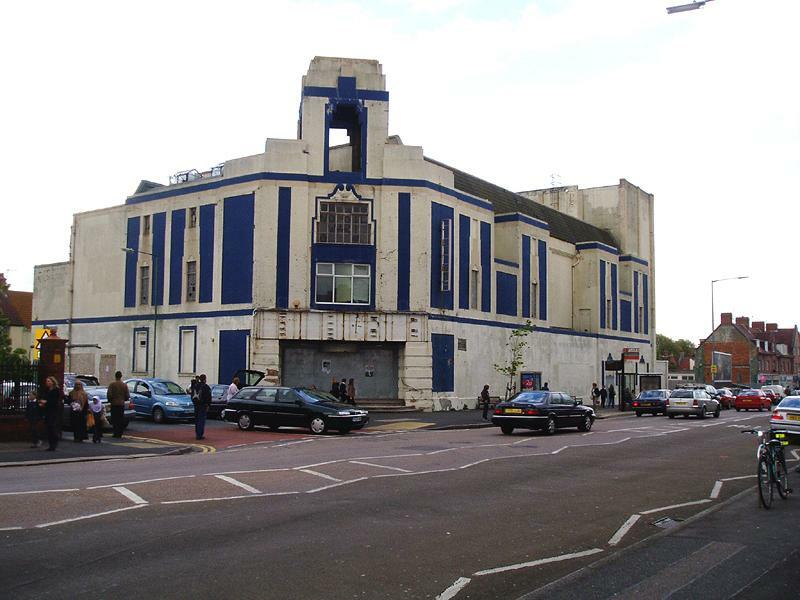 The first cinema to open in Hove was the Empire, in Haddington Street. It was opened in 1910 and closed in 1933, the year that the Portland Road Granada was opened by the lovely Anna Neagle. The Granada, having little in the way of Spanish features, was designed by H. L. Hemsley for a local company which went in to partnership with Mistin Lee, a larger group. Hemsley’s designs were modified at the insistence of Nat Lee, by F. E. Bromige, a specialist cinema architect. The Art Deco cinema was brick-built with stone dressings and a sixty-five feet tower, which housed an anti-aircraft gun during the Second World War. The auditorium had 1,636 seats and was equipped for both cinema and theatre use, though in the end was used solely as a cinema. Inside, the Compton organ was arguably its greatest feature with an illuminated console that changed colour from within its wings of frosted glass. The light fittings were held by ten life-size figures along the side walls that were decorated with coloured dragonflies and butterflies. In 1976 it became a Gala Bingo Hall which was launched by the actress Diana Dors but closed in August 2003. Gala Group Ltd, the owners, hope to demolish the building and use the site for flats. Although the nearby Methodist church and station are both Grade II Listed, the bingo hall is not, and there is therefore not much preventing its demolition. Some call it an architectural gem, others an eyesore, but one thing is for sure…the Gala Bingo Hall on Portland Road will soon be no more.